The well-x-trol WX-202 pressure tank floor stand WX-202 is specifically designed for residences. It requires only a minimum of floor space and has an appliance-like blue finish allowing installation anywhere. Exclusive butyl diaphragm along with the 100% corrosion resistant virgin polypropylene liner are secured by a positive hoop ring seal for added strength and reliability. This totally integrated system outperforms other Types of water chamber designs. The stainless steel air valve is welded rather than threaded to prevent loss of air pressure. 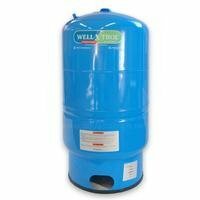 The finest quality custom mill steel is used in the deep drawn dome for extra strength while keeping tank WEIGHT to a minimum. Note: all tanks are pre-pressurized at 38 psi and should always be set 2 psi below the cut in of your pressure switch. It is recommended to check tank pressure before installation. Pressure switch settings should not exceed a 20 psi differential between cut in and cut out.